California firefighters are battling fires with the US state officially facing one of its worst years for the blazes in recent memory. The King Fire in California burning on 24 September 201 was larger than Las Vegas in area. Almost 7,500 firefighters are struggling with the King Fire east of Sacramento, which has forced almost 3,000 people to evacuate their homes. The fire is only 35 per cent contained and is threatening thousands of buildings and homes. 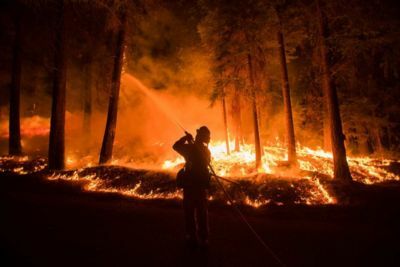 Five major blazes are currently raging across California, including the King Fire, which was started on September 13, allegedly by an arsonist, in El Dorado County, and has so far burned 362 square kilometres - an area bigger than Las Vegas. That compares to an average of 3,951 fires in the same period over the last five years, said spokeswoman Alyssa Smith. Authorities said about 95 per cent of the fires were caused by people, whether by accident or deliberate, while California remained in the grip of its worst drought in decades. Recent near-record temperatures also led to widespread blackouts last week, as residents cranked up air conditioners to find relief from the heat-wave. This page was last modified 06:15, 24 September 2014.